Then buying a Vietnamese silk painting should be in your priority consideration if you come to my country. I’ll tell you why. 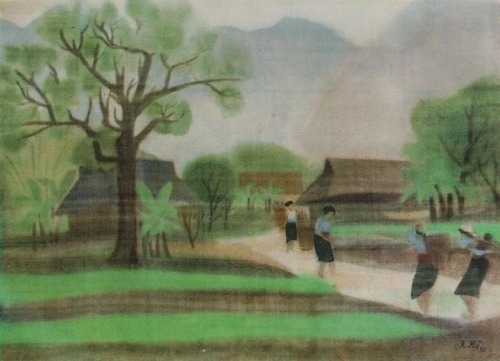 Silk paintings are very beautiful with various subjects about Vietnam such as countryside, natural landscapes, pagodas, historical events or scenes of daily life. Painting on silk is very suitable for such subject as artists manipulated water-colors over surface of silk. Silk painting is a unique gift from an Asian country. Together with other Asian countries like China and Japan, silk painting is a typical fine art of my country Vietnam. You give the gift your family and friends; they’ll know where you have gone to. You can buy such fine art gifts at a reasonable price. It certainly depends on quality of the silk, beauty of the picture, and skill of the painter. Yet, silk painting souvenirs usually range from 5 to 50 US dollar for a piece. Silk painting gifts are light in weight, in the shape of small scrolls, easily put in your travel luggage. So you don’t have to bother much about over-weight situation of your luggage during travel in Vietnam. It’s convenient, isn’t it? How Vietnamese silk paintings are made? In order for the silk to be painted on without getting blurred, the silk needs to be starched up. An artist uses rice water taken out when the rice is boiling, blends it with some alum, then uses a broad-based brush to brush mixed liquid over the surface of the silk. When the starch dries up, the artist uses a clean brush to drip a drop of fresh water on the surface of the silk to check. If the water gets absorbed into the silk without getting blurred, it is ready for the artist to work on. The artist uses a frame to stretch the silk on to work. The frame does not need to be as thick and sturdy as the one for regular cloth for oil painting, since the silk is fragile and does not need to be stretched too hard. The artist uses a broad-based pen brush to brush the surface of the silk with water to make the silk slack. After he has sketched on paper, he redraws the picture over the outline using black ink or a dark black pencil on the paper, then puts the paper under the silk for drawing. There is an advantage to drawing on a piece of silk stretched on an easel; the artist can move away from it for a check, but there is also a draw-back-the color might drip down the surface of the silk. Buying in fine art galleries or gift shops in Hanoi and Ho Chi Minh City. Buying online from famous website like Ebay.com, Amazon.com, Alibaba.com, etc. How do you think about Vietnamese silk painting? You may want to share some of your thoughts here. Also, if you find useful information in this article, would you mind encouraging me with a Like button? I’d love your thumbs up. Thank you!